On Saturday the 28th of October 2017, Jimmy was part of a group of 44 skydivers who set a new Australian vertical formation record in New South Whales at Skydive OZ. 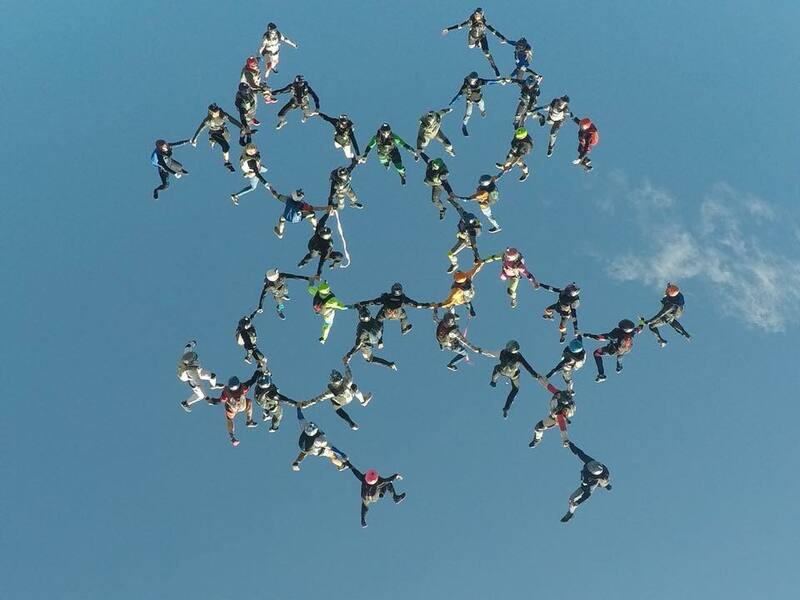 A vertical formation is when the skydivers are in a vertical orientation (in this instance everyone was flying head first (aka head down), and build a formation in freefall. 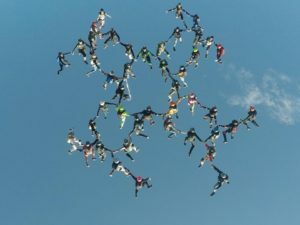 The formation is drawn on paper first, submitted to an Australian Parachute Federation accredited judge, and then the skydivers take to the sky to attempt to build the formation in freefall. 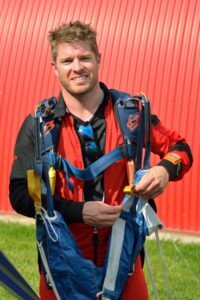 “Whilst the formation itself is quite simple (it’s a one point skydive), there is so much added pressure to these jumps that make it a real challenge. These include the pressure of getting a record and performing to the best of my ability, being surrounded by so many other people in the sky and the challenges and dangers that this presents, and of course the need for oxygen as we we’re jumping from up to 20,000 feet so were all required to carry oxygen supplies, it is pretty intense”, said Jimmy. To get that many skydivers in the sky at the one time required the use of three Cessna Caravan aircraft. The planes would all take off at the same time and fly in close formation until we exited. The visuals are insane! “My favourite part of the event was hanging out of the plane as everyone was about to jump, looking across and seeing two other planes with people hanging off it. It made you feel super alive and was such a special experience to be a part of”. The event was planned and managed by Australia’s best freefly team, FOCUS, a group (6 people) of elite Australian skydivers with a lot of experience and passion for the sport of skydiving. The event was 12 months in the making, with a large number of training camps taking place throughout Australia in the lead up to the event to get everyone prepared for the formation record attempt. Team FOCUS are planning another record attempt late 2019! Jimmy learnt to skydive in Jurien Bay in 2012. After completing his AFF with us, he pushed hard and continued jumping as much as possible. This is Jimmy, our marketing guy!